Rather than worrying about the really important things that I can't do anything about, I've been thinking about crib sets. Now, see, the thing about crib sets is that I don't know if I'm having boys or girls or a mix. I do know that I'm having babies. Three of them. Or so I'm told. Jess actually got me started on my crib bedding quest today. I stayed home from work because I didn't feel well. We were chatting, and I'm not sure how it came up but basically… I mentioned that I hate shopping. HATE IT. And well, I think Jess about fell out of her chair. Now, how a woman with five children under the age of three has time to even care about shpping, let alone enjoy it is beyond me. But who am I to question a woman with a stroller obsession? Admittedly, it's difficult to see in this image, so I highly recommend you go look at a full sized image before you express an opinion. So what do you think? Your opinion matters! P.S. Thanks for all your input on my small nervous breakdown the other day. You'll be happy to know my pantry is now in good working order and all my Passover craziness has been restored to normalcy. On to the next task! I have a follow up post brewing, but obviously the crib set is of a much greater priority! Edit: Let us set aside the debate about bumpers and quilts. 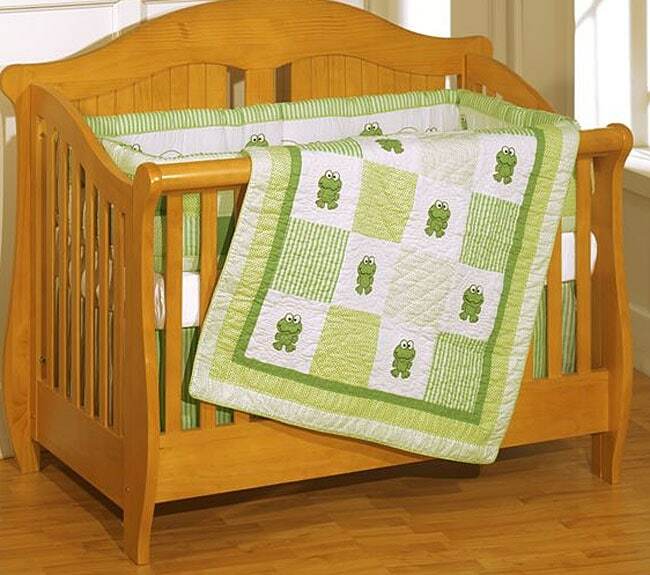 Suffice it to say, I'm not going to put a quilt over my newborn, but toddler beds still use crib mattresses, so they WILL get used (and the set is very inexpensive regardless, so it's not too shabby). As for the bumpers, I'm not getting into the debate. My pediatrician has no problem with them. We're going to use them. The frogs are soooo cute. Love them, love them, love them (one for each baby). I think it’s very cute. And of course I love the green color (if you’ve checked out the pics on my blog – you’ll know why).I’m not much for bedding ‘sets’ – I prefer to buy individual pieces and mix ‘n match. Also because much of what is in the set is stuff you’re not supposed to use anymore anyway – they now say that you shouldn’t use a bumper or put a quilt over the baby – so seems like a waste of money to me, to buy a set that contains those things.have fun!! I was about to say exactly what Carol just said. I think the design is adorable, but bumpers are not recommended (rebreathing issues), and neither are quilts.For my son and now, for the twins, I’ve bought fitted sheets for the crib mattress in a colour/pattern I like that goes with the sleep sacks they will wear to bed (Grobag is one brand, but I found some locally made swaddle blanket-sacks for the first while too). I am sorry but I have to say that bumpers are now a no-no (at least in Canada). Which is a shame because they are so cute. Fitted sheets and fitted mattress covers, that’s all you need. PS: I love the frogs, but it is surprising? I am ROFLMAO. I just finished reading Jess’ blog and went to check on yours. I am such a dork that I never realized she was blogging about you. Good luck with your quest to find the perfect baby bedding. You know, those sets are a total rip off, you can’t use bumpers, the quilt you’ll use for floor time, so it won’t be big enough for three babies to roll around on, and there are never enough sheets in them.You’re going to need at least ten sheets, because preemies have reflux issues more often than not, and you may well be changing the sheet multiple times a day.I would ask a kind friend to make you a large padded floor mat for the babies to all lie on, buy some lovely sheets and groovy curtains. i love the froggies. too cute and gender neutral. also, i work in a pediatric ER, i have yet to see one child accidentally smothered by blanket or bumper. for whatever its worth :). I love the frogs!!! Absolutely adorable! I love the frogs, though you might want to consider getting something different for each baby (I bet that makes things more complicated…) I had it easy – b/g twins…About the bumpers, apparently that phobia hasn’t gotten to Israel yet. I just took the bumpers off Nomi’s crib because she was using them to try to climb out. Delurking to say the frogs are adorable. I love it for either boys or girls. I would love to get that when I decide to have kids. Frogs are super cute and great for both boys and girls. Love it!I know absolutely nothing about quilts or bumpers. What’s the debate over? I love it. Seriously. Love it.It has the male stamp of approval too . . . Kevin walked in as I had it up on the screen and said, “Hey, I really like that. Is that for us when we have a boy?” (Nevermind that he’s deranged because to have boy babies, you need to actually GET PREGNANT. )We always used a bumper in Megan’s crib and damn glad we did as she was quite fond of jamming her head into random corners while she slept. With no bumpers, she’d had slat marks on her noggin for sure. Seeing as how she’s running us ragged these days, I’m pretty sure she was able to breathe just fine for the almost 3 years she spent in the crib with the BUMPERS OF DEATH.As you mentioned, we now use the quilt from her bedding set on her toddler bed. It’s nice because we can still use all the fitted sheets.Get these frog sets. Get them right now, they are fantastic!! Love the frogs. If you are looking for something that might coordinate, possibly look for ducks or bumblebees? Yellow and green could look really cute together. I, too, am a big fan of mix & match. I think the frogs are cute but very “boyish” to me. As for bumpers my niece has one on her crib and is 18months and never once was she found in there with her face pressed up against them. The one time the bumper was in the wash you got her leg stuck in the crib. I think my main concern would be to make sure that it is made of cotton and not a poly blend because the non cotton varieties tend to get those fuzzballs and look shabby sooner. I collect frogs so I absolutely love it. It will be perfect for any combo of boys and girls! !